I ate a lot of Campbell's soup when I was a kid. 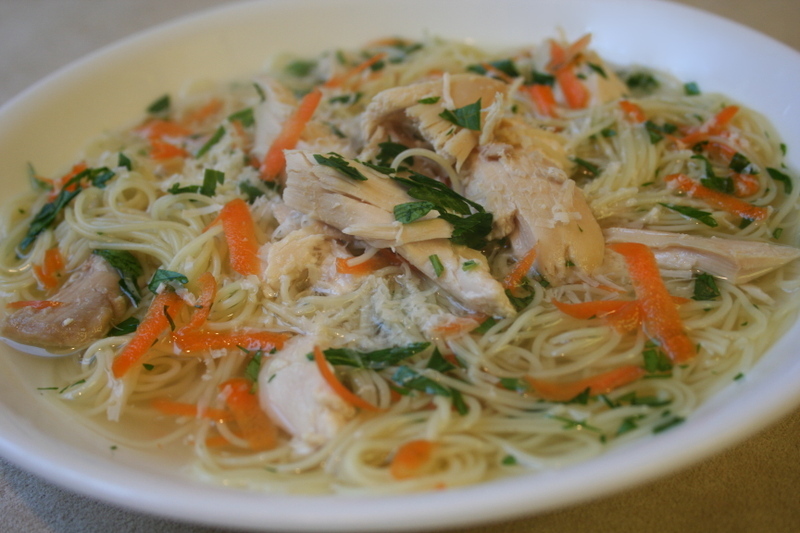 My favorites were chicken noodle, tomato, and alphabet soup, which I ate on a weekly basis. My mother once bought Heinz because it was on sale, and I immediately knew it wasn't Campbell's, as soon as I tasted it. Gradually, I started eating more adventurous fare (at least I thought so at the time), like Knorr and Progresso. 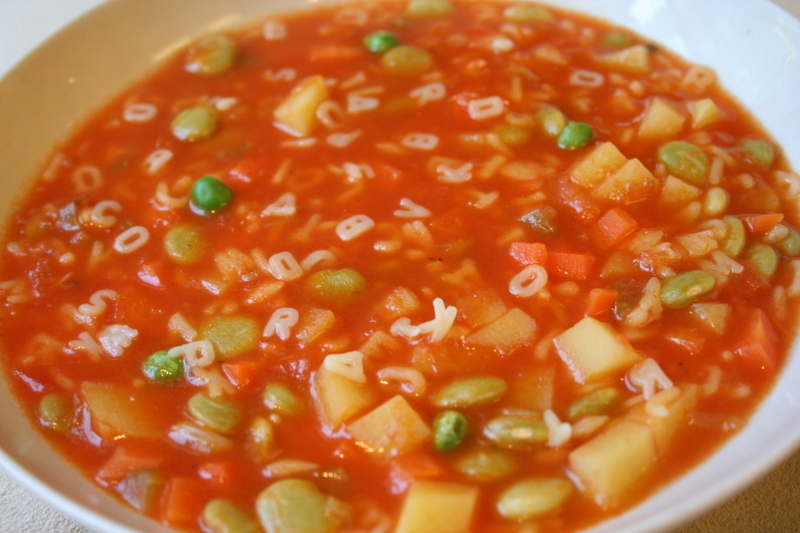 But, I still have a soft spot in my heart for alphabet soup. 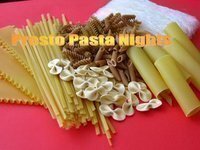 When I was at the grocery store, I saw a package of alphabet pasta and decided to make my own version, modeled after Campbell's. It wasn't hard. Tomato based broth, chopped vegetables, and pasta. 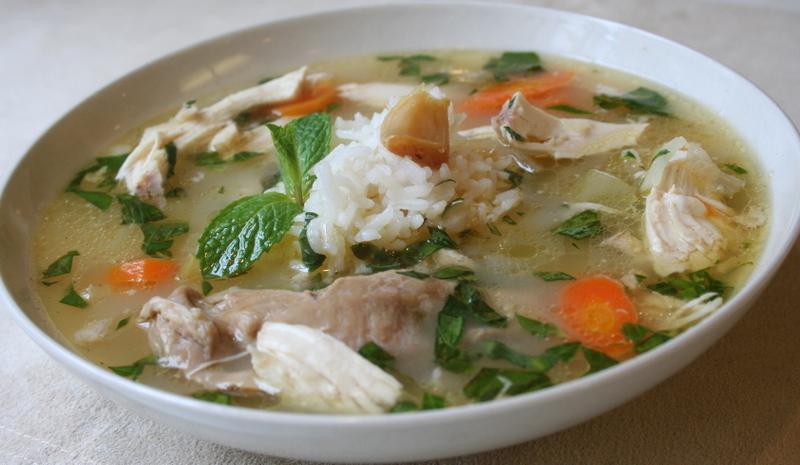 And I made sure the broth didn't have mystery floaty things in it, like onions or tomato pulp. I don't object to that now, but hated it when I was a kid. I enjoyed the soup I made, and thought it wasn't nearly as sweet as Campbell's, which makes me wonder if they're putting sugar into theirs. 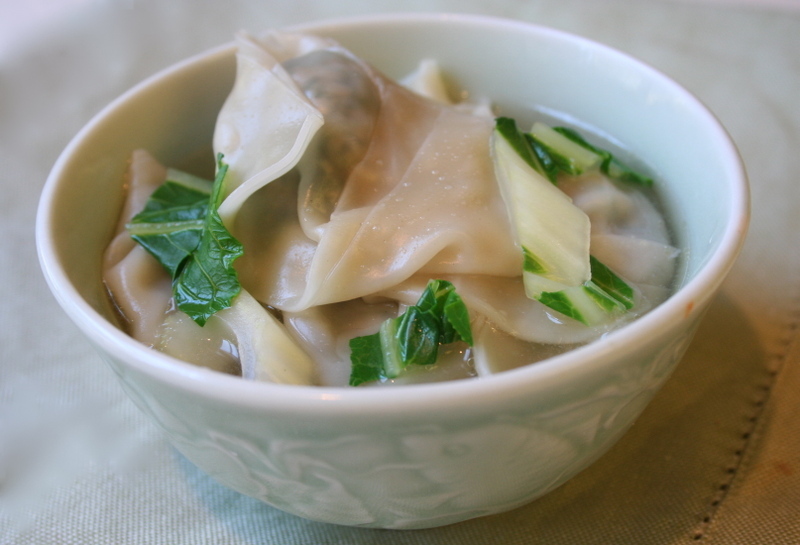 One of my very favorite comfort foods is wonton soup. If I see a recipe different from those I've tried, I must make it. To me, there's nothing so soothing and delectable than a soft wonton full of savory filling. This recipe from Martha Stewart Living included bok choy in the filling. Hooray! I've never made wonton soup with bok choy, so I had to correct that oversight. As it turns out, bok choy gives the dumplings a stronger taste than spinach, which was appreciated. To those who think making wontons is laborious, I urge you to plunge in and make them. It's a simple process, which I detailed here. Once you do it, you'll get faster and faster, until you can turn them out very quickly. It's officially spring, and coinciding with that are massive piles of asparagus in the grocery store and farmers market. The delicious green spears that recently cost as much as $4 a pound are now priced at $1.40 a pound. Great news for me, I can indulge my asparagus lust in all sorts of ways. I've always enjoyed asparagus soup, but usually prepare it with a roux base. My favorite recipe is an elegant and silky smooth version from Julia Child, which I often served for company. This recipe uses potatoes, rather than flour, to give a thick consistency. It's heartier than Julia's and very filling. 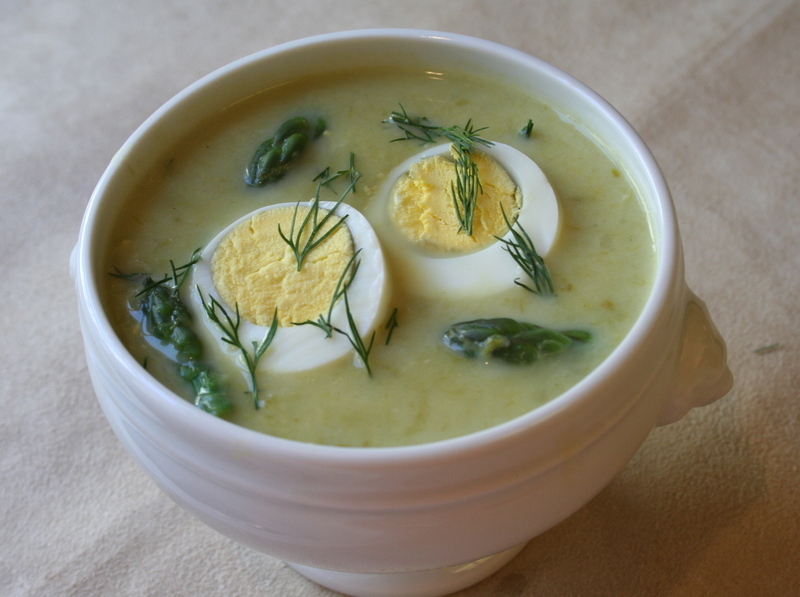 I made this soup today and realized it would be a nice soup for Easter, so I used eggs for the garnish. The herb I chose was dill, but basil, thyme and tarragon would work beautifully too. One day I'll make Mario Batali's marvelous tortellini in brodo. 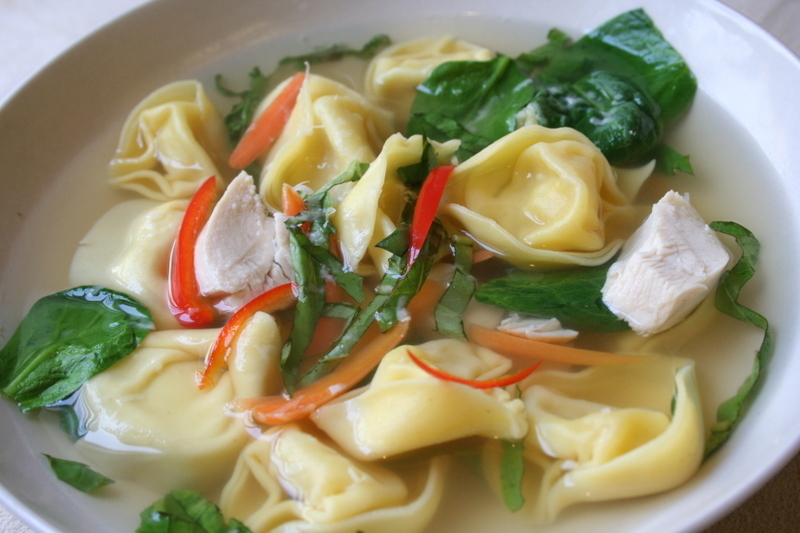 But, that requires making the tortellini from scratch, plus cooking an intense all-day broth. That will be an experience, I'm sure. But, I'm not up to that right now. Instead, I used ready made tortellinis and stock. This is a good tasting meal, that most people enjoy eating. And the fact that it's incredibly quick and easy certainly recommends it for those moments when preparing a meal seems downright demoralizing. It's also a recipe that lets you improvise and add the ingredients that you like. I added some leftover chicken, but Italian sausage would be good too. Or leave meat out and enjoy a perfect vegetarian meal. I'm not sure why this is named Minnesota wild rice soup. The fact that the best wild rice, in my opinion, is produced there might be a clue. 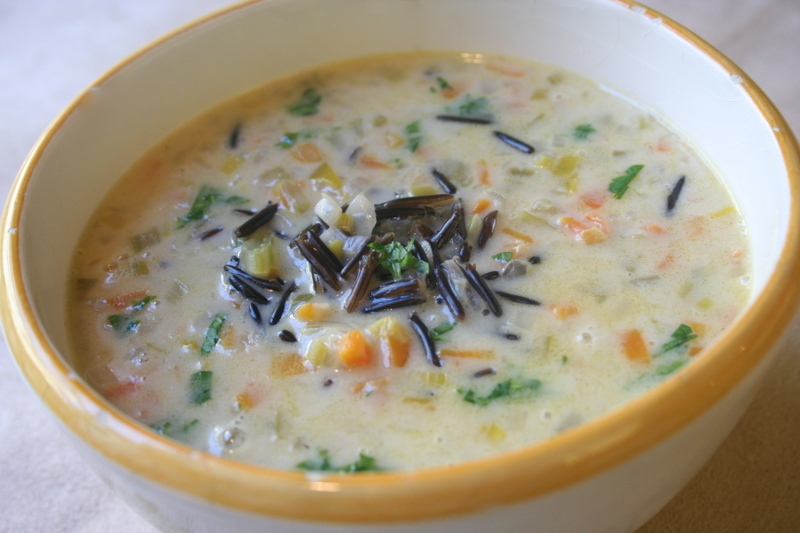 I loved the taste of the wild rice in this soup and the way it stayed whole and chewy, even after the soup was reheated several times. 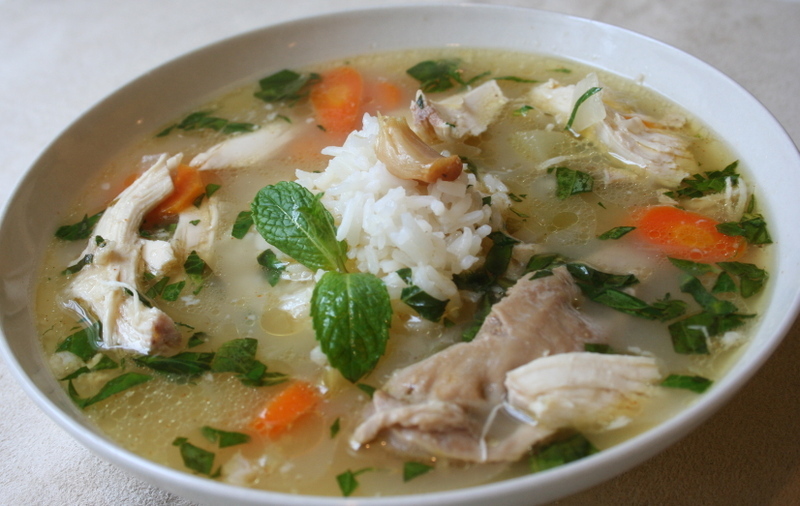 A simple recipe, it can be made very quickly if you have a fast chopping hand. I'm a slow chopper but didn't want to use a food processor. I like uniform pieces of vegetables in my soup, so I gladly spent time chopping carrots, leeks, and celery on Sunday, as I watched part of While You Were Sleeping for the umpteenth time. Alarm bells will go off for many people when they see the cream in the recipe. I didn't use the full amount, and it tasted quite rich. I normally drink skim or 1% milk, so just a small amount of cream feels quite decadent to my taste buds. This would make a lovely soup for guests, where I would probably use the whole amount of cream. After-all, what better honor than loading up your friends' arteries with lots of butter and cream? But, this was not a fancy occasion, as you might surmise from the chipped serving bowl in the picture. It's damp and cold here, with a steady drone of rain day after day. The supersaturated ground feels like pudding, sucking at my shoes when I go outside. And my sinuses decided to join in the fun, mimicking the rain outside. 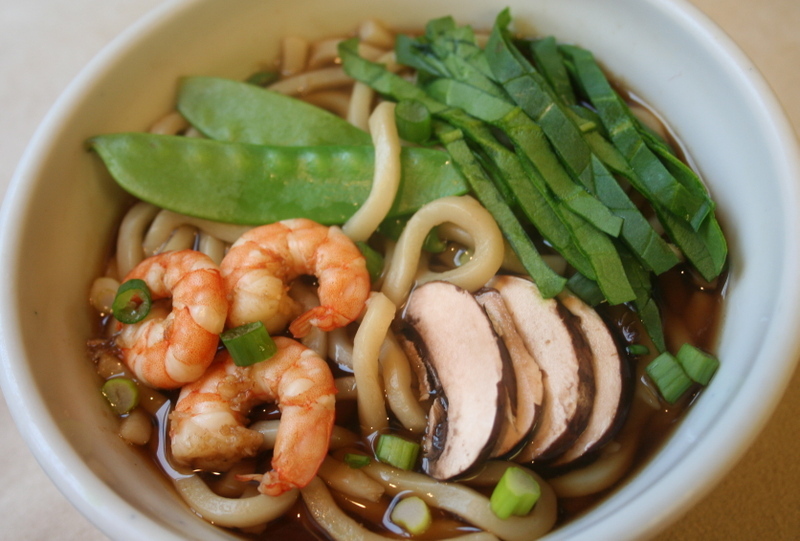 Thank God for jiffy udon soup. It cooks in two minutes, and easily accommodates leftover odds and ends of food. Here's a great place to use up the lonely veggies, scraps of meat, tofu, or seafood languishing in the fridge. In this case, I garnished it with shrimp, snow peas, shredded spinach, and scallions. 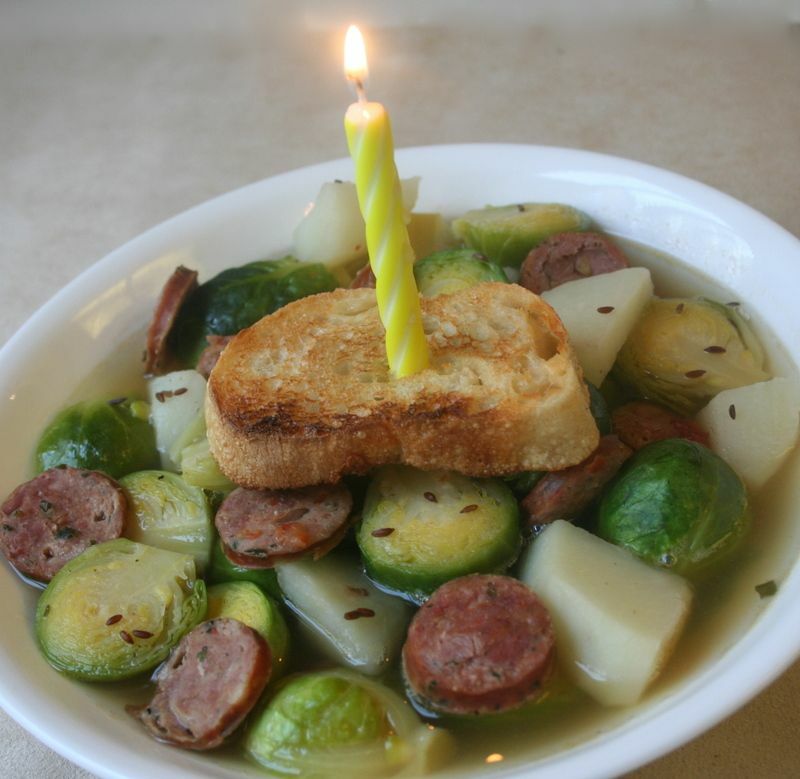 It's hard to make a Happy Birthday treat when the celebratory person is on a rigid diet. Yes, there are some sugar free and low fat options, but I chose a different route. My husband's love for brussels sprouts is almost an obsession. If offered a choice between any dessert or a big bowl of steamed brussels sprouts, he would gladly choose the latter. So, when I saw this soup recipe in Sunset magazine, I knew this would be perfect for him. It also contains sundried tomato turkey sausage, potatoes, and caraway seeds. And that's pretty much it. The soup had a slightly sweet flavor, from the caraway seeds and the brussels spouts. This certainly isn't a soup for people who hate these little cabbages, (as I like to think of them), but it was a huge hit with my husband. 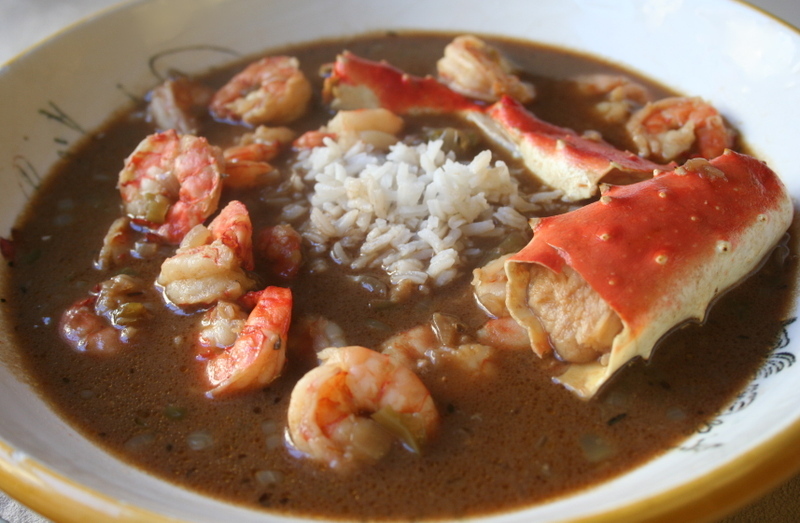 In my family, seafood gumbo is the ultimate dish to prepare and eat. Gumbo is always an event, because it's absolutely delicious, labor intensive, and loaded with familial memories. Not a complicated dish, it has definite quirks. You must prepare a dark brown, (or black, if you're a gumbo master) roux, which can take an hour or two of constant stirring. And there are the shrimps, massive amounts of them, which require teams of people, peeling and deveining until you feel your sanity start to slip. The kids had the job of peeling shrimp, and I'm convinced that the major reason people have children in my family is to ensure a steady pool of shrimp laborers. Until my mom died, I never put the gumbo together. I never had that honor. I just peeled shrimp for hours until I wanted to scream, while my mom and her sisters argued the finer points of sauteeing the vegetables, or the proper color for the roux. Try peeling 20-40 pounds of shrimp. The last time my cousins and I did that amount, about 15 years ago, we wound up fighting and throwing shrimp at each other. When I was a child, gumbo was a cheap dish to prepare. My grandmother would go to the docks and buy shrimp for less than a dollar a pound. And she caught her own beautiful blue crabs. Now, gumbo is quite pricey to make. I made a pot of it for Thanksgiving and wound up paying almost $200 for the shrimp and crab. Small wonder that I rarely make it now.